Our summer session begins on June 20th, please join us! Private and group sessions are available throughout the summer. Group lessons are perfect for siblings, family or friends. Groups of 4 are required for the group rate. Lessons are offered evenings and weekends throughout the summer. *Other times may be accommodated. Students ages 13-17 are invited to participate in this program. Students will learn steelpan technique in a band setting, while preparing for a performance at the end of summer. 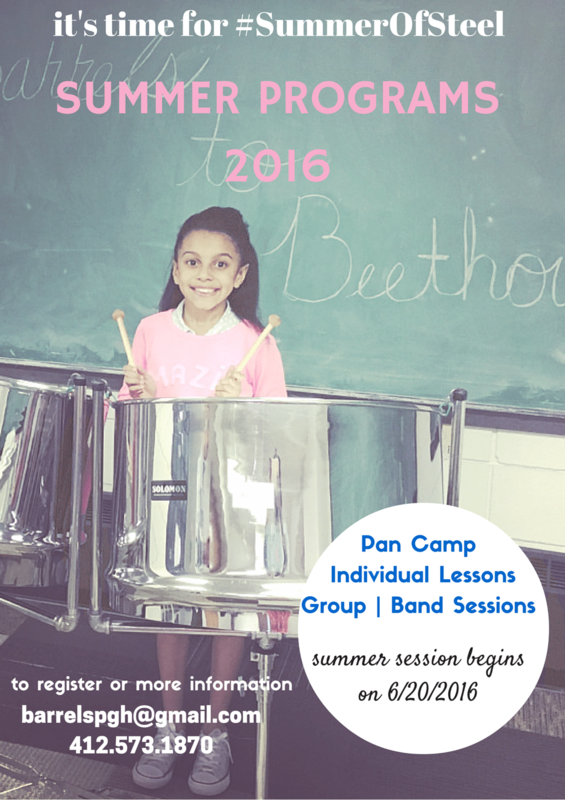 Instruction will included sessions with professional steelpan players and other musicians. Rehearsals will take place Friday nights at 7:00pm in our East Liberty practice space. The performance will be produced by the band members. More information available on our Steelpan Education page or contact us. Scholarships and payment options available!